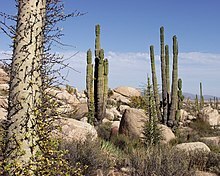 This article is about natural ecosystems. For the term used in man-made systems, see Digital ecosystem. For the system of classifying ecologically homogeneous land units, see Biome. "Biosystem" redirects here. For the journal, see BioSystems. Left: Coral reef ecosystems are highly productive marine systems. 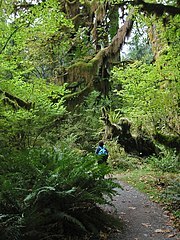 , right: Temperate rainforest on the Olympic Peninsula in Washington state. Biodiversity affects ecosystem functioning, as do the processes of disturbance and succession. Ecosystems provide a variety of goods and services upon which people depend. Rainforest ecosystems are rich in biodiversity. This is the Gambia River in Senegal's Niokolo-Koba National Park. 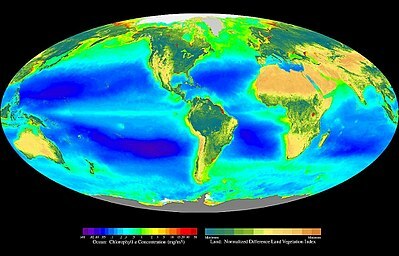 Global oceanic and terrestrial phototroph abundance, from September 1997 to August 2000. As an estimate of autotroph biomass, it is only a rough indicator of primary production potential and not an actual estimate of it. Primary production is the production of organic matter from inorganic carbon sources. This mainly occurs through photosynthesis. The energy incorporated through this process supports life on earth, while the carbon makes up much of the organic matter in living and dead biomass, soil carbon and fossil fuels. It also drives the carbon cycle, which influences global climate via the greenhouse effect. A freshwater lake in Gran Canaria, an island of the Canary Islands. Clear boundaries make lakes convenient to study using an ecosystem approach. 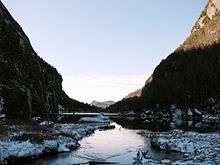 The High Peaks Wilderness Area in the 6,000,000-acre (2,400,000 ha) Adirondack Park is an example of a diverse ecosystem. While ecosystem management can be used as part of a plan for wilderness conservation, it can also be used in intensively managed ecosystems  (see, for example, agroecosystem and close to nature forestry). ^ The term ecosystem was actually coined by Arthur Roy Clapham, who came up with the word at Tansley's request (Willis 1997). ^ Hatcher, Bruce Gordon (1990). "Coral reef primary productivity. A hierarchy of pattern and process". Trends in Ecology and Evolution. 5 (5): 149–155. doi: 10.1016/0169-5347(90)90221-X. PMID 21232343. ^ Odum, Eugene P (1971). Fundamentals of Ecology (third ed.). New York: Saunders. ISBN 978-0-534-42066-6. ^ Tansley, A.G. (1939). The British Islands and Their Vegetation. Cambridge University Press. ^ Simberloff, Daniel; Martin, Jean-Louis; Genovesi, Piero; Maris, Virginie; Wardle, David A.; Aronson, James; Courchamp, Franck; Galil, Bella; García-Berthou, Emili (2013). "Impacts of biological invasions: what's what and the way forward". Trends in Ecology & Evolution. 28 (1): 58–66. doi: 10.1016/j.tree.2012.07.013. ISSN 0169-5347. PMID 22889499. ^ a b Ochoa-Hueso, R; Delgado-Baquerizo, M; King, PTA; Benham, M; Arca, V; Power, SA (February 2019). "Ecosystem type and resource quality are more important than global change drivers in regulating early stages of litter decomposition". Soil Biology and Biochemistry. 129: 144–152. doi: 10.1016/j.soilbio.2018.11.009. ^ Adams, C.E. (1994). "The fish community of Loch Lomond, Scotland: its history and rapidly changing status". Hydrobiologia. 290 (1–3): 91–102. doi: 10.1007/BF00008956. ^ Schoener, Thomas W. (2009). "Ecological Niche". In Simon A. Levin (ed.). The Princeton Guide to Ecology. Princeton: Princeton University Press. pp. 2–13. ISBN 978-0-691-12839-9. ^ a b Sagoff, Mark (2003). "The plaza and the pendulum: Two concepts of ecological science". Biology and Philosophy. 18 (4): 529–552. doi: 10.1023/A:1025566804906. ^ Carpenter, Stephen R.; Jonathan J. Cole; Timothy E. Essington; James R. Hodgson; Jeffrey N. Houser; James F. Kitchell; Michael L. Pace (1998). "Evaluating Alternative Explanations in Ecosystem Experiments". Ecosystems. 1 (4): 335–344. doi: 10.1007/s100219900025. ^ Schindler, David W. (1998). "Replication versus Realism: The Need for Ecosystem-Scale Experiments". Ecosystems. 1 (4): 323–334. doi: 10.1007/s100219900026. JSTOR 3658915. ^ Carpenter, Stephen R. (1996). "Microcosm Experiments have Limited Relevance for Community and Ecosystem Ecology". Ecology. 77 (3): 677–680. doi: 10.2307/2265490. JSTOR 2265490. ^ Lindenmayer, David B.; Gene E. Likens (2010). "The Problematic, the Effective and the Ugly – Some Case Studies". Effective Ecological Monitoring. Collingwood, Australia: CSIRO Publishing. pp. 87–145. ISBN 978-1-84971-145-6. ^ Likens, Gene E. (2004). "Some perspectives on long-term biogeochemical research from the Hubbard Brook Ecosystem Study" (PDF). Ecology. 85 (9): 2355–2362. doi: 10.1890/03-0243. JSTOR 3450233. Archived from the original (PDF) on 2013-05-01. ^ a b c d e Christensen, Norman L.; Bartuska, Ann M.; Brown, James H.; Carpenter, Stephen; D'Antonio, Carla; Francis, Robert; Franklin, Jerry F.; MacMahon, James A.; Noss, Reed F.; Parsons, David J.; Peterson, Charles H.; Turner, Monica G.; Woodmansee, Robert G. (1996). "The Report of the Ecological Society of America Committee on the Scientific Basis for Ecosystem Management". Ecological Applications. 6 (3): 665–691. CiteSeerX 10.1.1.404.4909. doi: 10.2307/2269460. JSTOR 2269460. ^ a b c Brown, Thomas C.; John C. Bergstrom; John B. Loomis (2007). "Defining, valuing and providing ecosystem goods and services" (PDF). Natural Resources Journal. 47 (2): 329–376. Archived from the original (PDF) on 2013-05-25. ^ Grumbine, R. Edward (1994). "What is ecosystem management?" (PDF). Conservation Biology. 8 (1): 27–38. doi: 10.1046/j.1523-1739.1994.08010027.x. Archived from the original (PDF) on 2013-05-02. ^ a b Chapin, F. Stuart; Pamela A. Matson; Harold A. Mooney (2002). Principles of Terrestrial Ecosystem Ecology. New York: Springer. pp. 362–365. ISBN 978-0-387-95443-1. ^ Alexander, David E. (1 May 1999). Encyclopedia of Environmental Science. Springer. ISBN 978-0-412-74050-3. Chapin, F. Stuart; Pamela A. Matson; Harold A. Mooney (2002). Principles of Terrestrial Ecosystem Ecology. New York: Springer. ISBN 978-0-387-95443-1. Chapin, F. Stuart; Pamela A. Matson; Peter M. Vitousek (2011). Principles of Terrestrial Ecosystem Ecology (Second ed.). New York: Springer. ISBN 978-1-4419-9503-2. Gurevitch, Jessica; Samuel M. Scheiner; Gordon A. Fox (2006). The Ecology of Plants (Second ed.). Sunderland, Massachusetts: Sinauer Associates. ISBN 978-0-87893-294-8. Krebs, Charles J. (2009). Ecology: The Experimental Analysis of Distribution and Abundance (Sixth ed.). San Francisco: Benjamin Cummings. ISBN 978-0-321-50743-3. Molles, Manuel C. (1999). Ecology: Concepts and Applications. Boston: WCB/McGraw-HIll. ISBN 978-0-07-042716-7. Schulze, Ernst-Detlef; Erwin Beck; Klaus Müller-Hohenstein (2005). Plant Ecology. Berlin: Springer. ISBN 978-3-540-20833-4. Smith, Thomas M.; Robert Leo Smith (2012). Elements of Ecology (Eighth ed.). Boston: Benjamin Cummings. ISBN 978-0-321-73607-9. Tansley, AG (1935). "The use and abuse of vegetational terms and concepts". Ecology. 16 (3): 284–307. doi: 10.2307/1930070. JSTOR 1930070. PDF. Willis, A.J. (1997). "The Ecosystem: An Evolving Concept Viewed Historically". Functional Ecology. 11 (2): 268–271. doi: 10.1111/j.1365-2435.1997.00081.x. Wikimedia Commons has media related to Ecosystems. Look up ecosystem in Wiktionary, the free dictionary. Scholia has a topic profile for Ecosystem.